Chicken baby food made in the crockpot! 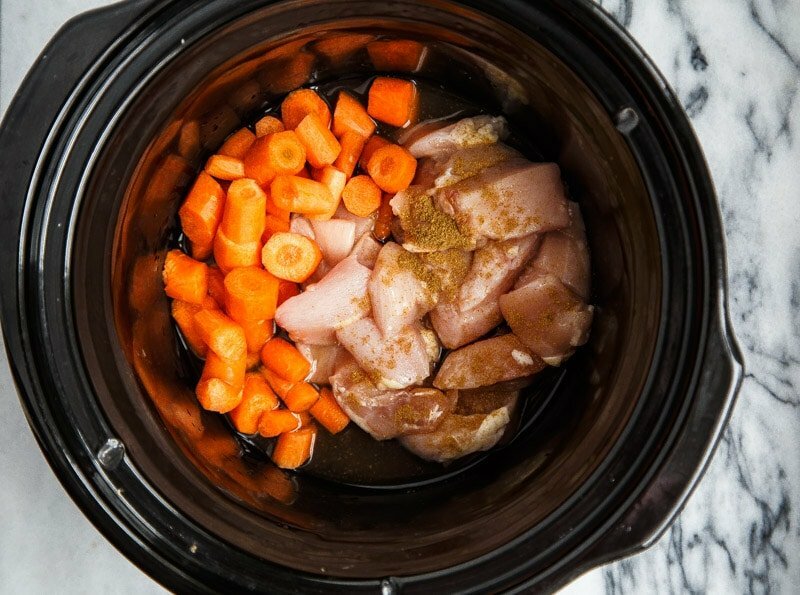 Tender shreds of chicken with carrots for baby. 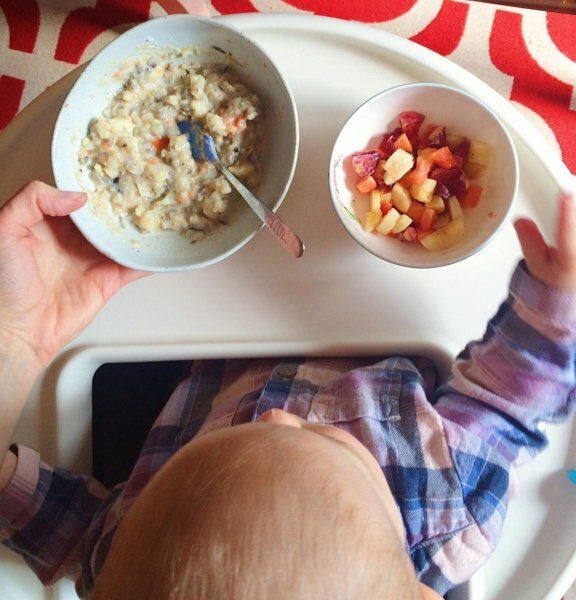 If you’re looking for more baby food recipes, try my ebook, Hip Hip, Purée! My Recipes for Feeding Bébé. The first time I made Camille meat puree, I wasn’t sure if I should feed it to her or the cat. I poached a chicken breast, and pureed it in the Vitamix. One look, one smell, one reluctant taste, and I was done. Surely I can do better for my sweet babe than cat food fare! Camille didn’t start eating meat until around 7 months. I started her on sweet potato puree at around 5 months, but she didn’t show much interest, so I took time off before intermittently reintroducing her to food. By the time we were in a good rhythm of 2 tablespoons of puree once a day, I kept hearing my pediatrician’s warnings in the back of my head: ‘her iron supply needs to be restocked; give her meat’. She was well past 6 months, and probably ready for it. 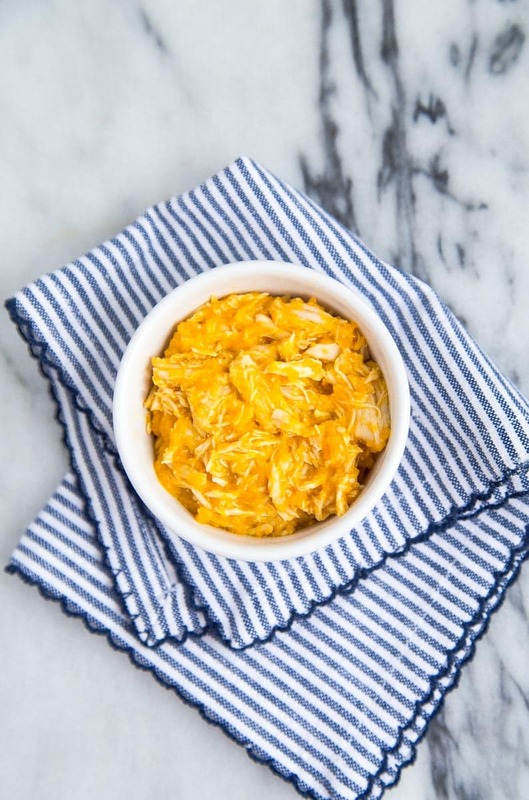 This chicken baby food was months in the making. I just had to work up the courage to make it. 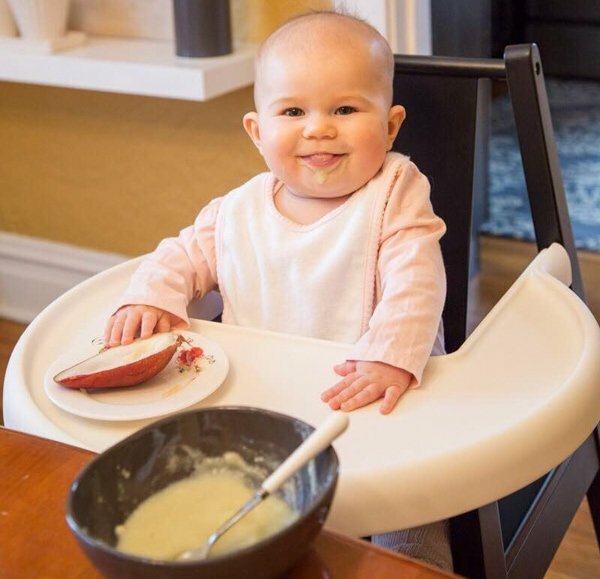 Camille at 7 months eating chicken and celeriac puree with soft pear bites for dessert. A pretty important side note: I don’t eat much meat myself. I think we have an animal on our plate one night a week or so? Last night, we had farro salad with carrots and white beans. The night before? Pasta Alfredo with Broccoli. Before that? This Brussels Sprout Tater Tot casserole. It just doesn’t occur to me to cook meat most days. I actually love to order animals at restaurants, but I have a thing about seeing raw meat in my kitchen and then subsequently consuming it. If you believe in the blood type diet, I am spot-on for an A positive—full fat dairy, no meat, and tons of legumes. It makes my body happy. I say this to show my complete inaptitude for cooking meat for my child. My ebook has plenty of kid-approved recipes for meat purees! 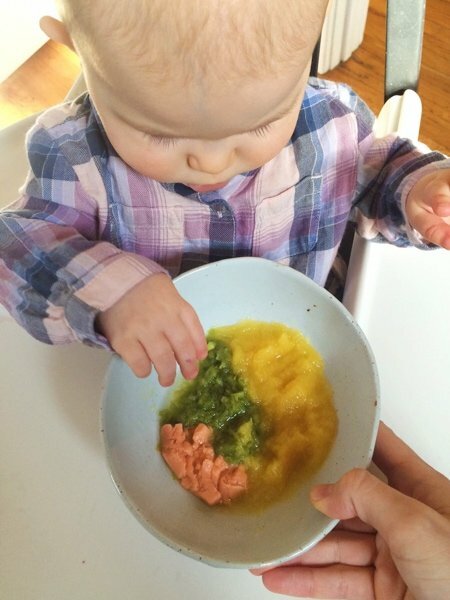 Camille at 8 months eating spaghetti squash puree, chunky green bean puree, and flaked salmon. The next time I tried making meat for her, I faced another kind of disaster. Her dad and I were about to enjoy a rare beef dinner. Before plopping a local grass-fed chuck roast in the crockpot (with my eyes closed, of course), I cut off about 1 pound of it to cook for Camille, sans salt. I rubbed it with black pepper, seared it in a stock pot, and covered it with water and a bay leaf. I figured by the time our crockpot roast was done, her roast would be, too. My intention was for her to enjoy a no-salt version of our food. I was so very wrong. Her roast was tough and chewy. Dad and I were eating a melt-in-your-mouth pot roast, and baby had meat so tough, even I couldn’t chew it (and I have all of my teeth)! Camille at 9 months eating cream of chicken and wild rice soup with a fruit salad of papaya, banana, and blood orange bites. I ended up making her a quick no-salt gravy, and pureeing the baby roast in the Vitamix. She ate it mixed with green beans and mashed turnips. It wasn’t her favorite—she much preferred these curried sweet potatoes, but she ate it. And I felt like Mama of the year for giving her that much-needed iron-rich beef. Now, at 10 months, Camille needs to progress beyond purees. Even though she doesn’t have any teeth, she’s been gumming steamed broccoli, tiny whole wheat pasta shapes, and raisins lately. This video of her eating broccoli basically sums it all up. The time was nigh for me to make her tender melt-in-her-mouth meat. So, I reached for my crockpot. I mean, that’s what those things are for, right? Tender meat? I knew I wanted her chicken chunks to be saucy and rich, almost like my recipe for instant pot salsa chicken. Baby isn’t warming up to jalapeños no matter how hard I try (kidding), so I reached for carrots. When the chicken is done cooking to the appropriate fall-apart-ness (technical kitchen term), the carrots melt and become a creamy sauce. Hot damn! I even want to eat this! I stirred in a little cumin to mimic that rich, barbecued beef flavor. As a Texan, my kid will eat barbecue and jalapeños one day–you can hold me to that! 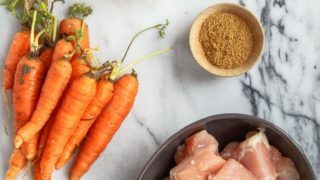 This recipe for chicken baby food with carrots comes together so quickly, and it makes enough frozen leftovers for many meals! I love having cubes of it in the freezer to stir into whatever grain dish we are eating. 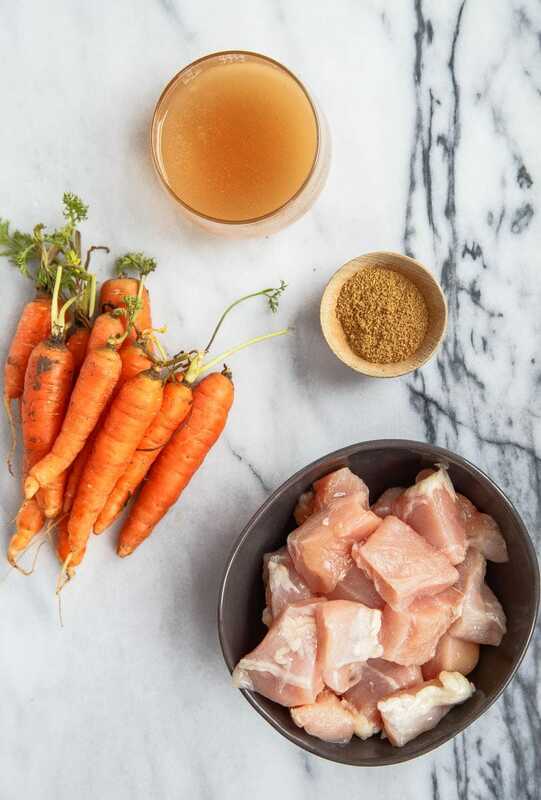 If I make us a pot of quinoa for the week, a few cubes of carrot-chicken puree are great stirred in for baby. 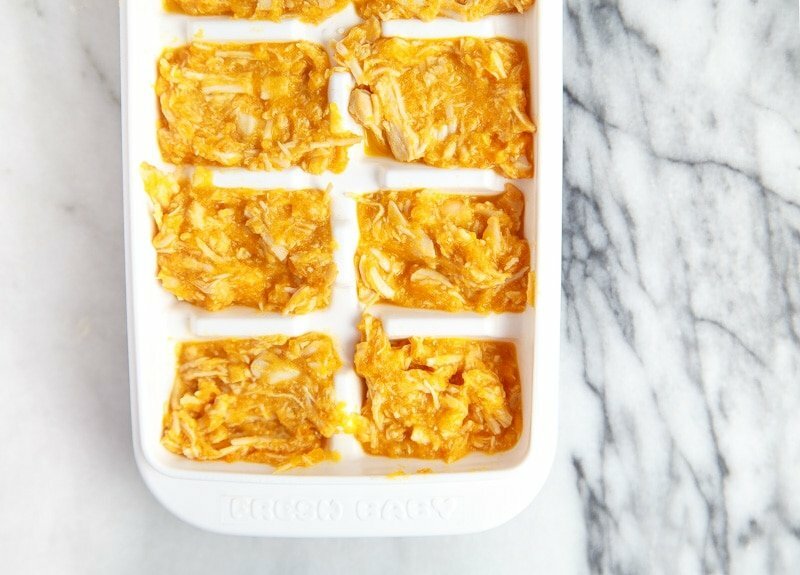 If you’re looking for more tips on how to freeze baby food, check out my ebook! You’re going to need 1 pound of carrots (these are baby carrots from our CSA. I can see my Mom cringing at the dirt on them. The carrots were well-scrubbed, Mom, I swear). I grabbed 2 chicken breasts for this recipe because it’s what I had in the freezer. In the future, I would use chicken thighs because they have slightly better nutrition and fat (which is good for baby). Side note: see Natalie’s post about crock-pot’ing for baby here. Also, grab some cumin and a mere 1/2 cup of the no-salt vegetable broth you made last week. Toss it all in the slow cooker. Turn it to high. Come back in 4-5 hours. Stir, stir, stir. The carrots will melt, the chicken will shred. The babe will be very happy. If your baby is younger and not quite ready for meat shreds, just puree the whole mixture. Demolished dinner: potato and turnip puree with spinach, bites of beef, grass-fed cheese chunks, and raisins for dessert. If you’re interested in more baby food recipes, check out my ebook for baby food purees! It contains 15 purees and tips and tricks for preparing and freezing baby food that is nutritious and so easy to make! Place the lid on and cook on HIGH for 4-5 hours. Remove the lid, and stir to shred the chicken. Mash the carrots a bit with a fork. If your baby is young, puree the whole mixture first. Make a baby food cookbook for us! These have been wonderful! My baby is still at single flavors but I am counting the days. I second that. Baby food cook book!!!!! Also, more beef recipes and White fish??? Oh, Taylor–thank you SO much! So many people have told me about this podcast. It’s time to finally listen–thank you! Thank you! 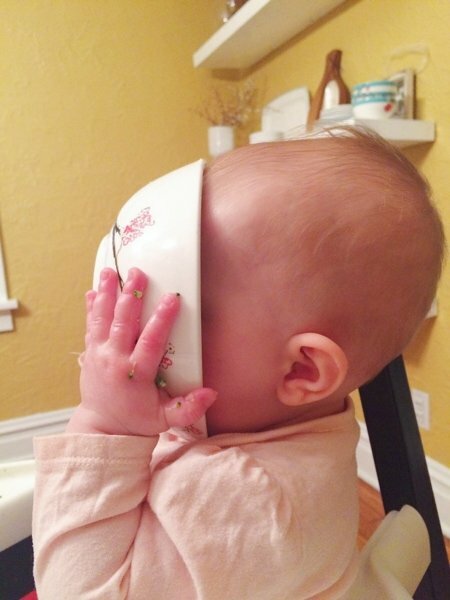 Please make a baby food cookbook. Hi Christina, just wanted to say everything looks amazing. I was very interested in the recipe where Camille is 8 months in the picture about to eat the salmon with the pureed spaghetti squash. I was looking for it but I guess I am not looking correctly. Can you please send me a link to it? Thank you so much. Well what I loved about the sweet potato recipe is that I had not thought about using coconut milk or barley … I was feeding sweet potatoes cooked with apples. So the ideas about using a variety of ingredients and blending them together into something tasty was very helpful. Next time you’re cooking in the crockpot for yourself and want to make her something too but without the extra seasonings, just wrap her portion in foil and put it in with yours. As long as the foil’s ends are up and out of the liquid, none will get in but you can cook it all together. I cook baked potatoes in the crockpot with roasts this way, it works great! No problem! :) I love making the baked potatoes that way, and I do a small portion for our 1 year old occasionally too. I like your flavor combinations, looking forward to trying a few with ours the next time I go shopping. :D Plus I make a lot of things from this blog since it is just the three of us, so many tasty recipes in good portions. :) Keep up the good work! Hey this worked great! I used boneless skinless chicken thighs because it was in the freezer…but a win here! Thank you!!! I just made this today for my 10 month old son and it’s the first time he actually enjoyed eating meat! I tasted it too and it was really good! 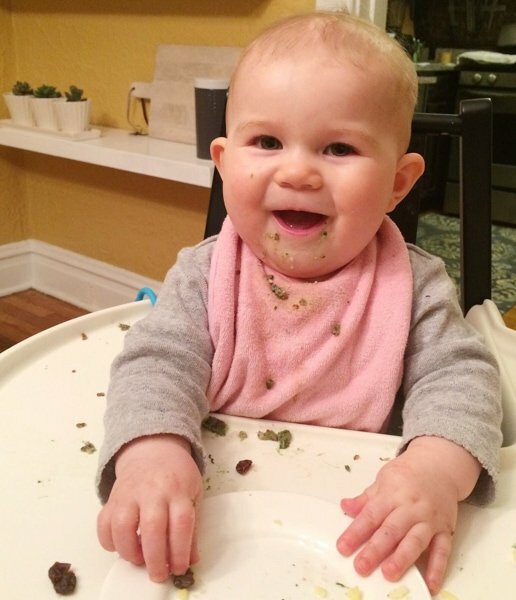 Thank you for sharing this and all of your other baby food recipes! We made this tonight! I had a side myself it was so tasty :) How long is it goon in the freezer for?! Thanks so much for sharing. Hey,Kristina. I’m Chinese and I was very interested in the baby recip. I’m going to make it for my 10month year old baby Abby. By the way,can we be friends in the real life? I love American food, but I’m not good at it, so maybe you can help me? Thank you for this! I read everywhere to cook meat for babies till it is “extra-soft” but no recipes or pointers on what that means, so I’ve been nervous to start cooking meat for my daughter. I can’t wait to give this recipe a try! Could I add turmeric to this? Will baby still like it?